Contact our talented support team to see how Ascora can benefit your business. We are here to help startups: If you're a one user company, you'll only pay the web price. A job management solution with all the essentials for service companies of all sizes with unlimited phone support. Customisable option for businesses with unique requirements. UNLIMITED Integrated SMS from within Ascora. Ability to design any Template needed in Word. Import the Template into Ascora to generate any Job documentation needed! JSA, Work Requests, Safety Checklists. 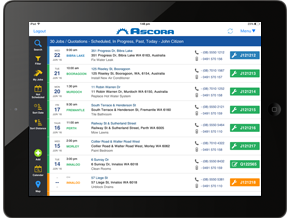 Fully in-built into Ascora - NO separate app. NO double entry of data. View live notifications as Jobs are started, completed, require re-attendance. Turn by Turn navigation available for Field Workers. INCLUDED as part of your Ascora subscription.